In this painting the red squares are in the foreground. They appear to float on top of a background of various colors, where the blue mass reads as an integral shape and therefore dominates the other areas of this background. At its right border (1), the blue is convex, meaning it curves outward, creating the feeling that it is pushing outward to the right. This dynamic is emphasized by the sliver of white (2) which is being worn thin by blue’s intrusion. The white is concave. It’s a dart or arrow pointing to the right. Stop, you may say at this point. This a colorful painting, I like it, that’s enough. You’re over-thinking this thing. These blotches of color are not going, pushing or invading anything. They’re just sitting there. True. The PAINT is sitting there. But the PAINTING is not a physical object; it’s an event in the mind. The power of abstraction is that even though there is no identifiable object depicted in an activity, the viewer of the painting will EXPERIENCE an activity. A drama, really, full of tension, aggression, pushing and pulling…and resolution. Since the red squares are not distributed evenly, we get the sensation that they are drifting from one side of the “landscape” to the other. From left to right? Or from right to left? My sense is that they are blowing to the right. Try it. The drifting reds are not round. Imagine them as red dots and the painting becomes a circus. Imagine them petal shaped and it becomes sentimental. No-no. The reds have to be angular to add frisson. Your mind likes edginess. Keeps you alert and on your toes. Why would anybody go to the trouble of analyzing a painting at this length, you may say. Maybe somebody needs to get out more, has too much time on her hands. Ha,ha. I’m merely taking the time to articulate what is going on in your mind when you’re standing in front of a painting that grabs you. At museums I often hear one person say to her companion, I like that. Well, I’m curious why. Someone will look at a painting for a long time. Why? Well, I’m suggestion they’re swept up by the drama. The drama is in the mind. Oh, and by the way, if you flip the painting, the drama changes…errrm, dramatically. This drawing is a dramatic departure from the literal. The artist happily gives up illustration and instead moves into a play on form. Such a venture calls for omissions: you don’t have to draw everything that’s in that pile of stuff, you pick and choose as you go with the call of the composition emerging on your page. Notice how this page teases you out of your prosaic, fact-loving mind and leads you into the pleasure of pure form. If there had been more stripes, they would have nailed you down in the simple association to hey-that’s- a-tablecloth. 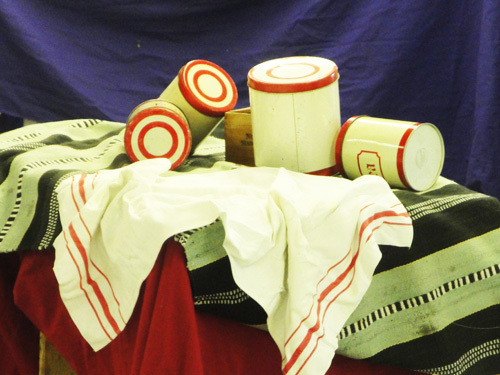 Instead, the artist skips the literalness of the tablecloth and picks just three stripes (1) which lead you to the little pot (2) that plays second fiddle to the grand pitcher (4). The pitcher, however is also underplayed, it’s incomplete, but you know everything you need to know about it: look at that superb curved handle. Then, to balance the composition on the right we have nothing but a line. But what a line. So elegant, it hold its own against all that drama at (1) and (2). 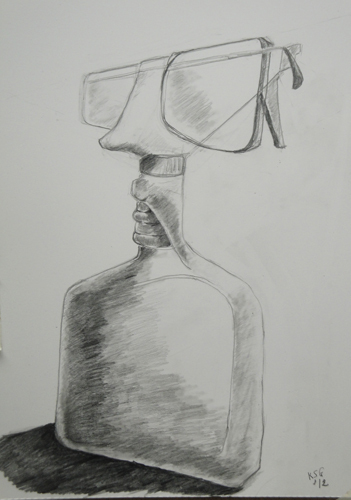 The class debated whether the drawing should be cropped and considered this version. The question was left open. If I’d wanted to, I could have made an academically correct drawing with the proportions of the figure corresponding to what I actually saw. But I chose not to. More often than not, I choose to distort a little, trading anatomical correctness for statuesque drama. In this pose, about twelve minutes, I dramatized the figure to make it look as if seen from below, like a statue on a pedestal. The feet are big and the head is small. In other words, I foreshortened the figure. Why? It’s fun to see if you can achieve a certain effect by breaking the academic rules. 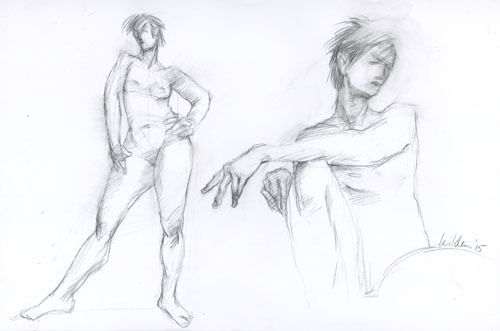 Then, during a seated pose, I got fascinated by the hands and the neck. I zoomed in for anatomical correctness. I repented, ha. We started the class by practicing the ellipse. You can’t draw an ellipse, you have to swing it. You practice swinging your hand over the paper and then—keeping that swing—you lower the pencil and there’s your ellipse. You fill a couple of sheets of paper with these practice ellipses and then when you feel you’ve got that swing, you slide your drawing onto your board and you swing those elliptical canister tops into place. 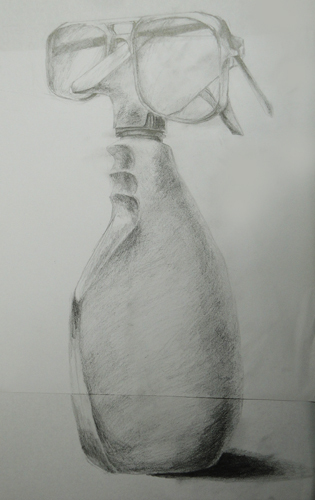 Alejandra was faced with a still life consisting of ellipse-stressing canisters and some droopy drapery. But in her drawing nothing is canned and nothing droops. 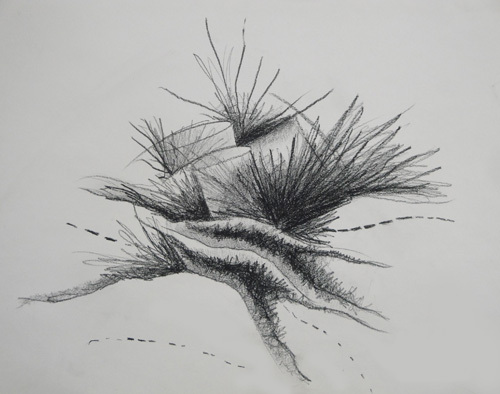 In her drawing, the drapery looks like oak tree roots and the ellipses seem to fade into memory. She either found this set up very exiting or boring beyond tolerance, because something in her imagination popped. Notice how the carefully cropped selection (right) coveys even more tension, drama and mystery than the whole composition (top). We will have more examples of cropping in the following two posts. 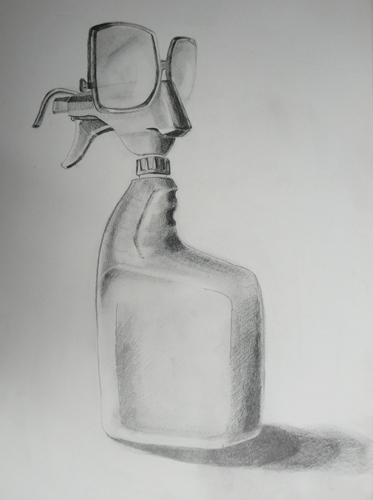 Yes, it’s a spray bottle wearing a pair of glasses. I get paid for thinking up stuff like this. Let me explain. This exercise combines two topics: perspective and profile. In the previous class we had worked on the topic of perspective. Nothing elaborate, just one-point and two-point perspective, using architectural images to find the vanishing points. 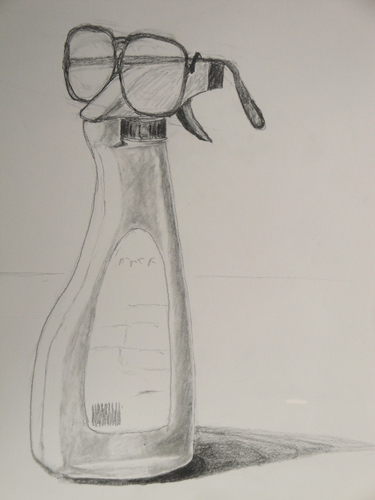 For our purposes in this drawing class, perspective is not crucial, but it’s a useful tool. It comes in handy, for example, when you draw a face in three-quarter view. The eye farther away from the viewer (the one behind the bridge of the nose) will be smaller than the eye closer to you. That farther-away eye is tricky to draw, so we didn’t even go there. It’s enough to just get the point of diminished size. And to get that across, I set a pair of glasses on a spray bottle, one combo for each student. 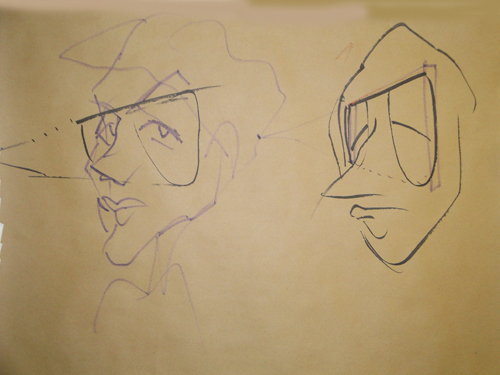 Notice, that the perspective in the glasses is exaggerated in these drawings, according to my instruction. Students are universally reluctant to exaggerate anything for the simple reason that they want to draw what they see. Fine. But to add drama and to make a point, you need to summon the courage to exaggerate. Add that to the lesson in perspective and profile. All in all, a profitable class. Initially, eyebrows were raised at the goofy sight of spray bottles wearing glasses. Then followed the challenge of getting all the elements together, representationally and technically. 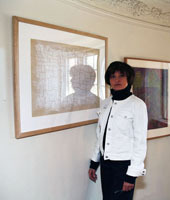 The motif only works if the drawing technique is fairly precise and the object is shown matter-of-factly and in its entirety. This is why one student found it necessary to add a strip of paper at the bottom of her initial sheet. A fourth lesson learned: it’s ok to do this, if you run out of paper, just tape on an addition. I have since learned that one of these drawings has been framed and hung in a law office. Do this at home: grab a spray bottle, put your glasses on it, reflect on the complexity of reading a face. See? Not goofy at all.